I was so boring this week, it was amazing. I went to a terrible place (basically the 90s) to hang out with a friend, got a massage (OK 2) and a facial and a pedi, and worked out with my trainer a bunch – managed to get up to 300 kilos on the leg press, although I was pretty broken the following day. Awesome. 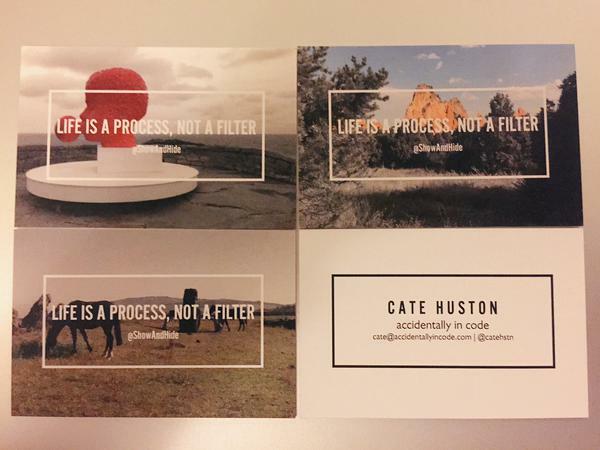 Got new business cards! They are pretty cool. Fixed a bug on Show and Hide and sent out a new build. Lot of admin catch up – e.g. filing expenses for the last err… 3 months, digging myself out of an email hole. Some contract stuff etc. Watching The Good Wife, finished Melissa and Joey season 4. Still working on Elements of User On-Boarding. A new edition of Technically Speaking is out! Chiu-Ki and I were on a podcast – Turing Incomplete. It was fun! My post about moderating my first panel is on the Moderating Panels blog. @anarcharaccoon: [pic] Friend: What are you gonna be for Halloween? Me: Um… Anarchy.